March 2012 – He Said What?! Aaron certainly does have his particular ways of doing things and is not likely to change. I saw this fact about Aaron two times this morning. He paused. “Mom, can you take the top leaves off?” So I discussed with him how you can hold and eat a strawberry with the top leaf part on, and then throw the top leaf part away. 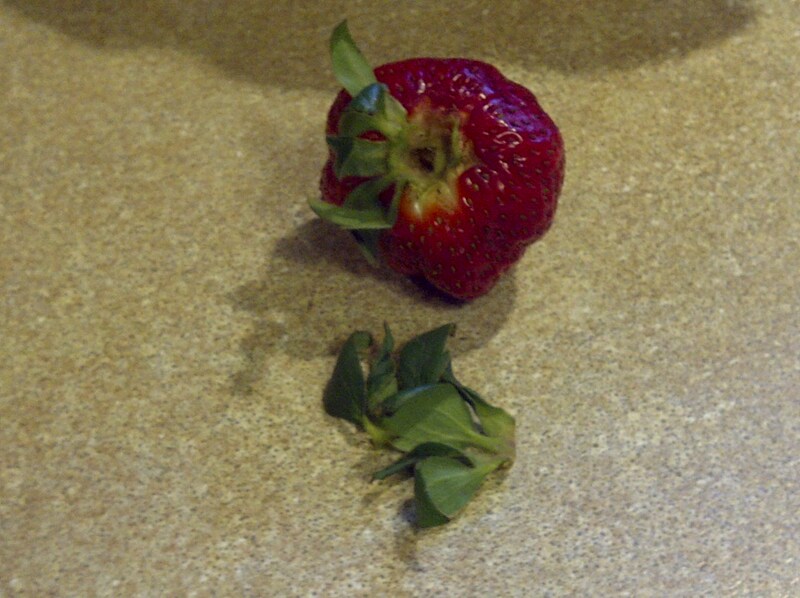 But, no, he will have no part of eating a strawberry with the top leaf part on. He will not change concerning the top leaf part of a strawberry and I may as well remove that top leaf part of the strawberry if I expect him to eat it. Aaron has a reversible comforter on his bed. He has always had the polka dot side up as opposed to the striped underside. Granted, the polka dot side is prettier…………..but last week I decided to see how he would handle a change. 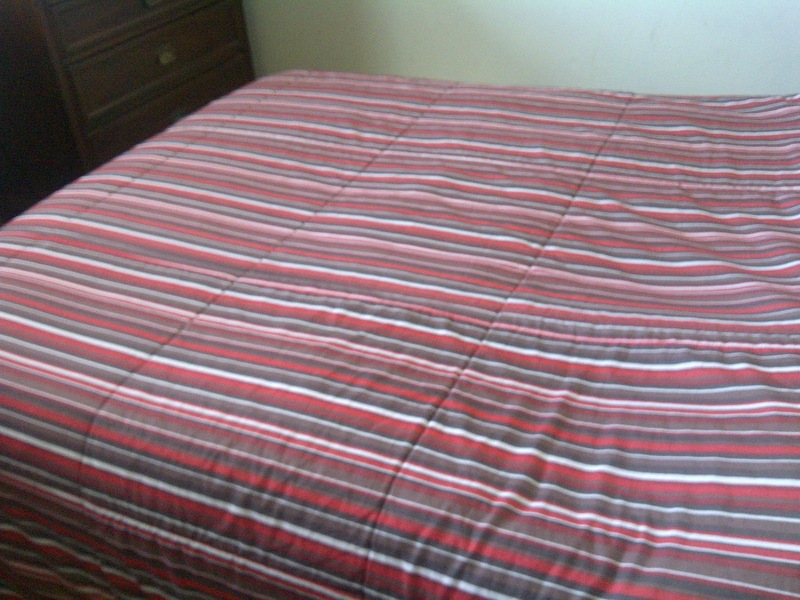 After we changed his sheets and he had left the room, I flipped the comforter over to the striped side. He surprised me by letting the striped side remain up for several days. 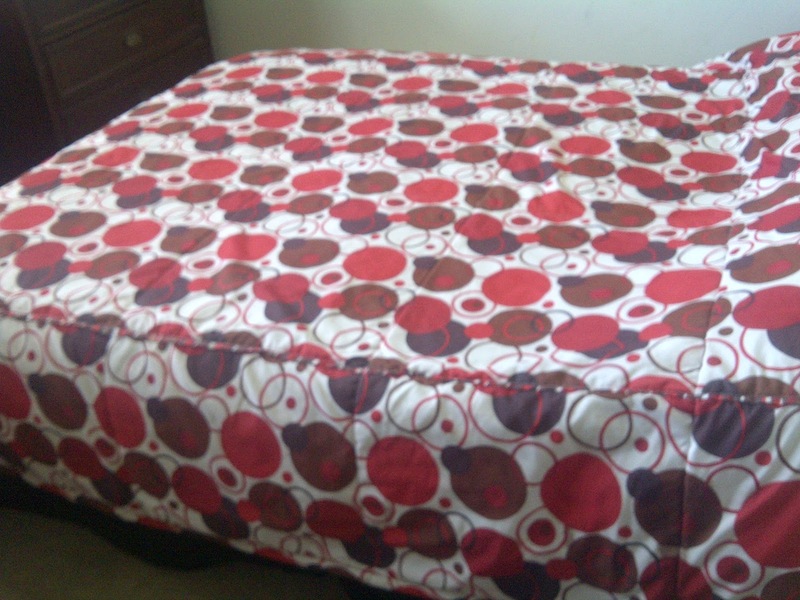 But finally he flipped the comforter over to the polka dot side. We did not speak of this flipping incident. Until this morning. So now the comforter is comfortably on his bed, situated where you can see the polka dots part. He will have it no other way, I am sure now. There is not much flip-flopping in Aaron’s world, that’s for certain! Author hesaidwhatksPosted on March 31, 2012 February 28, 2016 Categories UncategorizedLeave a comment on Mom, Can You………….? Gary came home from work and we sat down for supper, as we always do. This time together is very special – time to enjoy dinner, talk about our day, and just relax with each other. 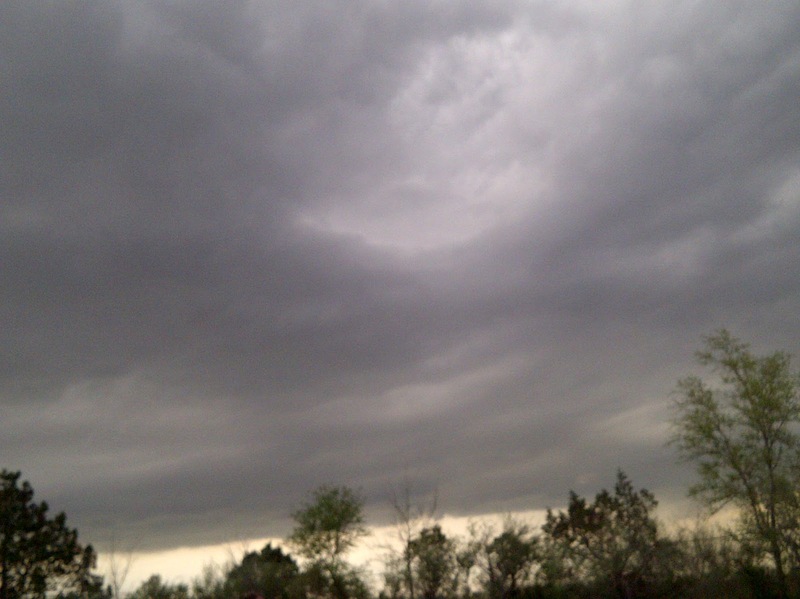 But looking outside, we noticed some gathering dark clouds on the horizon. A few minutes later we heard a low, distant rumble of thunder. Knowing that Gary wanted to take more of the fence down, we didn’t linger over our dinner. After eating, Gary hurried on outside while I quickly cleaned the kitchen. Then I joined him at the soon-to-be-gone fence. He dismantled while I carried boards over to the stack that he had begun the night before. Jackson, our huge Great Dane, went back and forth between us, all the while sniffing the heavy air as if he knew that something was brewing. And brewing it was! 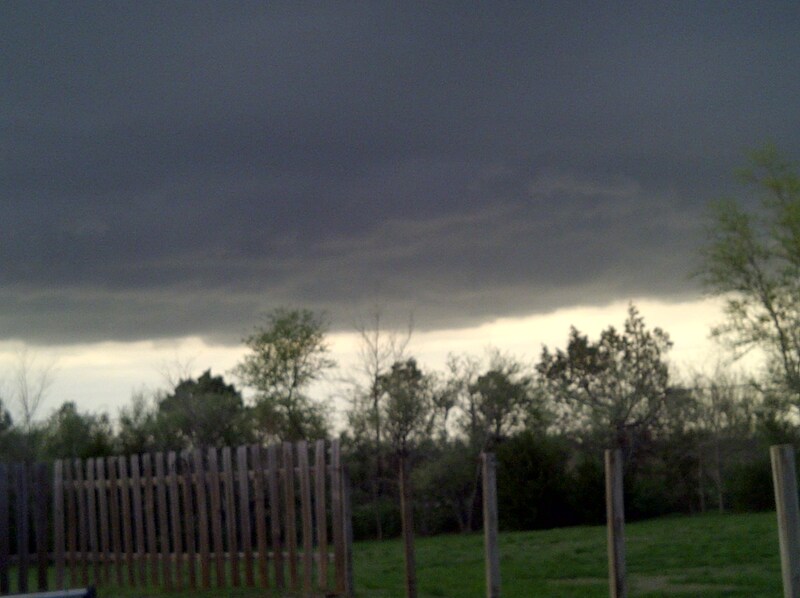 The clouds were rolling and darkening by the minute as we hurried to complete another section of fence. We didn’t want this interruption to stop us from completing the sections that Gary had begun. The thunder was much more frequent and the winds were stronger. Finally, there was a bright flash of lightning, and soon our back door opened as Aaron burst out to tell us about the lightning he had just seen. We continued to scurry about our job in the hopes of finishing at least this certain part that Gary had begun. The storm was building, the threat was worsening, and the lightning becoming more frequent and intense. Gary insisted that I go inside, then, while he completed removing just a few more boards. Finally, he was able to remove the boards before hurrying inside to safety. Sure enough, as the evening progressed, the storm increased. The rain came, the lightning seemed constant, the thunder boomed, and the hail pinged off the windows. And this morning – the sun is bright, the birds are singing, the air is fresh and cool. The storm has passed. Gary and I wouldn’t have chosen to have a storm at that time last night, even though we always need the rain. The rain causes our grass and flowers to grow, and nourishes our trees. But last night we had planned to finish the fence. This interruption has been a set-back, a delay, in what we wanted to accomplish. Our weekend will be busy and now our schedule has to be adjusted. And isn’t this just how life’s delays are? Delays can be for good and happy reasons, but more often our bumps in the road are not very pleasant. 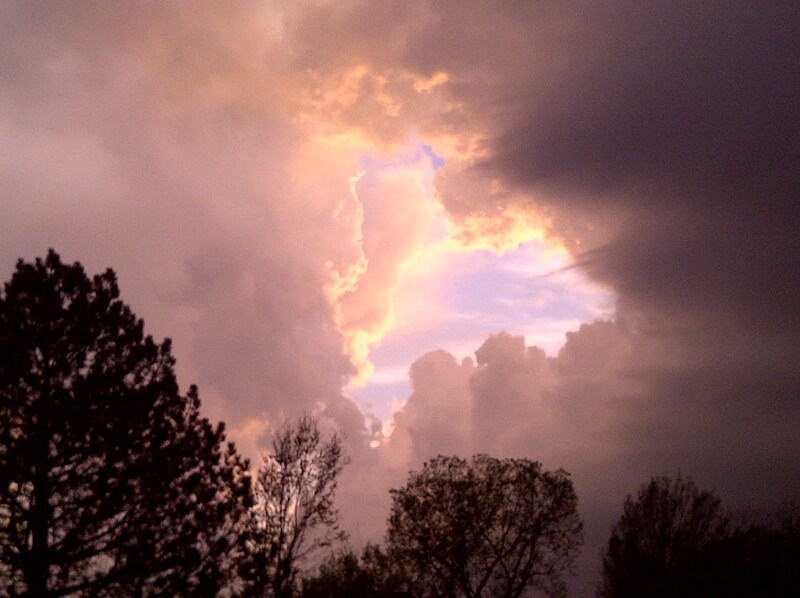 We see the storms on our horizon and feel the heaviness in the air. Sometimes it happens overnight; at other times we watch it coming over a period of weeks and months. Those trials of life; those hurts; those fears; those great disappointments. We walk out of the doctor’s office, stunned at the sobering news we’ve just been handed. We stand beside the grave of our loved one, never dreaming we would be in this place at this time of life. We pick up the phone and hear our child’s voice, broken and confused. We perhaps experience the coldness of a relationship that at one time was dear and valuable to us. We watch others experience financial blessing or other joys that never seem to quite come our way. We wait for the other shoe to drop; wait for the surgery; wait for the pink slip; wait for the loneliness to go away; wait for the consequences of our child’s actions to happen…………..while we wish that we could have just enjoyed life and been able to accomplish those things that we set out to do in the beginning. Look to the future, to the plan that God has that we don’t know or understand or can’t even fathom at this point. The sufferings that we experience now are nothing compared to the eternal glory that awaits those that know Him. The clouds will open, even it’s not until heaven, but there is a reason and there is a hope for each of us. Let’s keep our eyes on the One Who sent the storm and trust Him for the outcome! I do believe that I have firmly established the fact that Aaron loves to eat. A lot! Loves it a lot and eats a lot! I was out yesterday when my cell phone rang. My friend, Melody, asked if she could stop by after picking her son up from school. She had a treat to drop off, she said. Oh my, how nice! I love those unexpected surprises! I told her that I wouldn’t be home, but Aaron might be home by then. Melody brought the treat over and sure enough, I wasn’t at home……….but Aaron was. She rang the doorbell and heard him inside saying something about “ding-dong, the doorbell is ringing” or some such thing. He said hi to her and was pretty polite, I think, which brought a deep sigh of relief from me. We never know with Aaron. He’s been known to just grab things from people at the door and then firmly shut the door. If someone doesn’t know Aaron, that can be pretty shocking. This simple exchange made quite an impression on Aaron. When I returned home, Aaron immediately said, “Mom! This woman came to our door and brought those!” He pointed to the bag on the table. 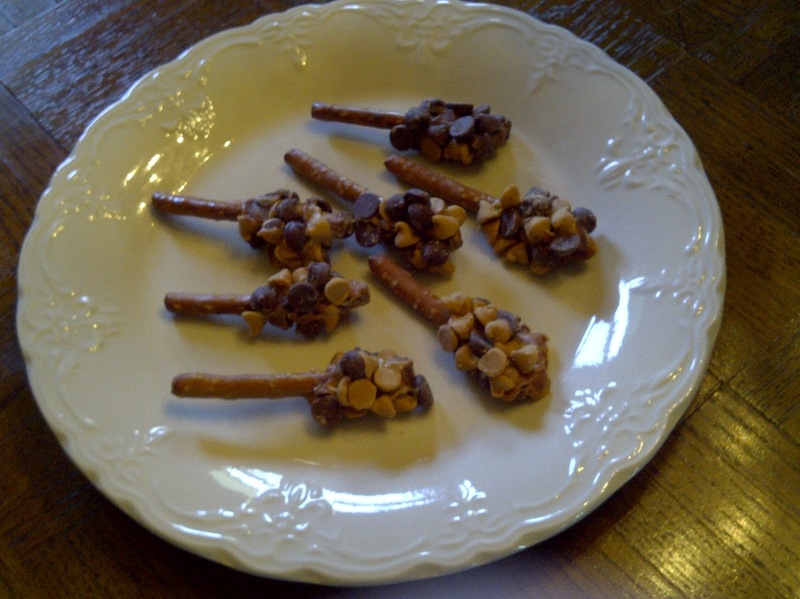 Inside were delicious dipped pretzel goodies. YUM!! Aaron, since when do random people that we don’t know show up at our door with food? I assured him that she is a friend from church and we talked about how kind it was for her to share these delicious treats with us. He said it in such a hopeful way that I knew what his mind was imagining. And I could almost hear the angels singing in Aaron’s world. He has just discovered the PERFECT woman!!!!! She comes to our door, delivering FOOD!!!!!!!!!!! I hated to ruin his dream…….to pop his bubble………to jerk him back to reality. No, Aaron…….Melody does not routinely deliver food. This was a special thank-you, a sweet gesture in more ways than one……..a treat! Do not expect regular food deliveries. Come back to earth! Now do you want a bowl of cereal? You can fix it yourself! Author hesaidwhatksPosted on March 29, 2012 February 28, 2016 Categories UncategorizedLeave a comment on She’s Perfect! He bought potato salad for lunch……….again. Except this time it’s FOUR pounds of potato salad. 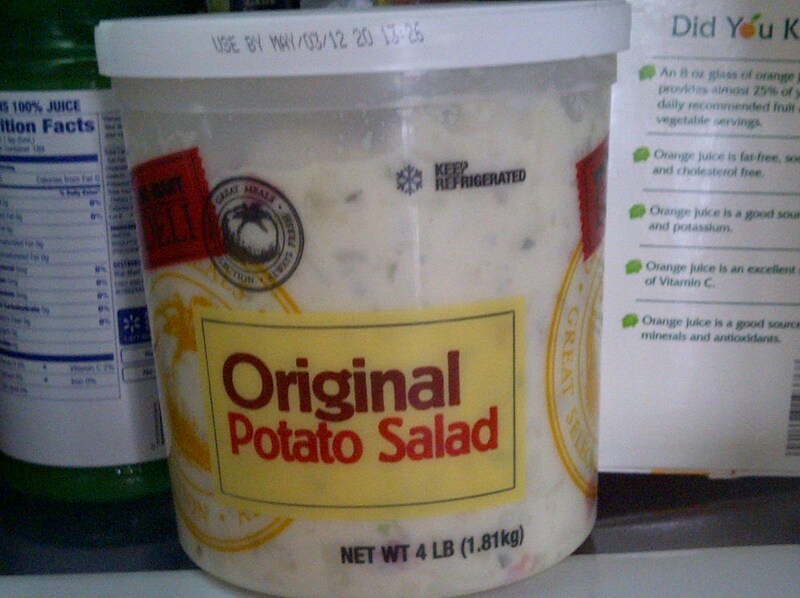 FOUR pounds of potato salad would cause some stomach problems, I would say. Then he asked, “Can I just eat some of it for supper?”…………..even as he was smelling the Beef Stroganoff in the crock pot. Later Gary, Aaron, and I sat down to eat supper. I offered Aaron his potato salad and he declined, saying that he wanted some of the noodles and stroganoff……………two helpings when all was said and done…………and some deviled eggs. But no potato salad. That’s his way of saying no, I don’t like it, and I will not eat another bite of that FOUR pounds of potato salad. Now we have a container of potato salad, FOUR pounds of potato salad, hardly touched. Aaron was right when he said he ate a few of it when he took it out of the frig. I know that Gary and I will not eat any of that FOUR pounds of potato salad. This ranks right up there with the day he bought THIRTY-SIX rolls. At least we liked the rolls. But this FOUR pounds of potato salad…………well, it’s not our favorite. We’ve had such a hot and dry summer, along with many others, and so the recent storms and rain that have come our way have been very welcome. It’s been so nice to see the clouds building in the distance, then hear the rumbling thunder, and eventually, hopefully, see and hear the falling rain. My flowers and vegetables are much happier, as am I! It’s been a relief to not have all the watering responsibilities over the past few days that I’ve had all summer. However, with some of our storms comes the inevitable and unwelcome strong winds. I could wish that all of our rains were like the sweet and gentle little shower that we received this morning. But this is Kansas and more often than not our storms are accompanied by strong winds. I can move our outdoor baskets of flowers to a safe location but there really is nothing that can protect all of the flowers or vegetables that grow around our house and in our gardens. Most of my flowers are perennials and so I really don’t like to see them damaged or killed. Replacing them every year can get expensive! The other day we received a late-night storm with those high winds, and when I saw my Black-Eyed Susans the next day my eyes lighted on a new patch of flowers that were leaning over and not looking the greatest. I propped them back up and hoped for the best. Today I couldn’t help but notice them right away when I walked out the back door. 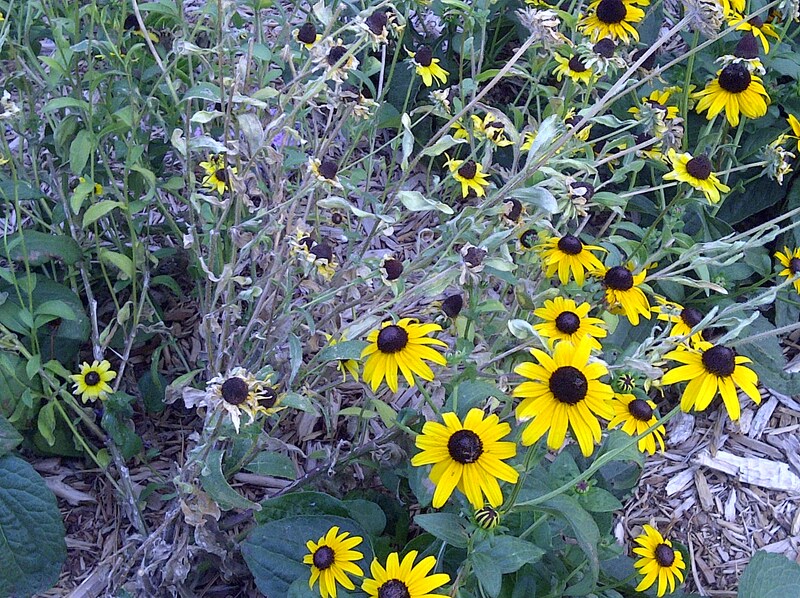 There they were, all brown and wilting instead of perky and bright yellow. They were some of the tallest flowers in that patch and were such a bright spot in my garden. Now they look dismal and dead, lifeless and limp. The wind was too much for them and they are gone. We all have storms in our lives at certain points. Sometimes the rains fall rather gently. We are actually refreshed by the waters when all is said and done, even though it may mean that we have to endure some rather stressful times. Yet at other periods of life the storms blow in with ferocity. The winds are strong and challenging, more than we feel that we can bear. They may mean prolonged suffering as we are relentlessly buffeted by one piece of bad news after another. We wonder if our roots can withstand the continual beating of the winds. We no sooner feel the winds of our trials easing up when we are suddenly blown again by another heartache or pain. I’ve seen those I love being blown like this and I have experienced those times myself. It’s during these heavy winds of storm and uncertainty that we need more than ever to cling to God and to remember Who He is. We may not understand the reason for the wind or see the purpose that He has in mind for us, but we do know that we can trust God’s character and His goodness. In Psalm 73:26, the Psalmist said, “My flesh and my heart may fail, but God is the strength of my heart and my portion forever.” Instead of giving up, leaning over, becoming uprooting and lifeless, let’s let God be our strength! Let’s weather the storms and winds with His grace and peace so that we can be upright, bright, and blooming for His glory and for His pleasure. I bought two new food items on Friday. Well, new to us in the sense that one is an item I have never bought and the other is an item that I rarely buy. Of course, Aaron noticed both of them and so last night we had a conversation. Is there ever a time that we DON’T have a conversation?! 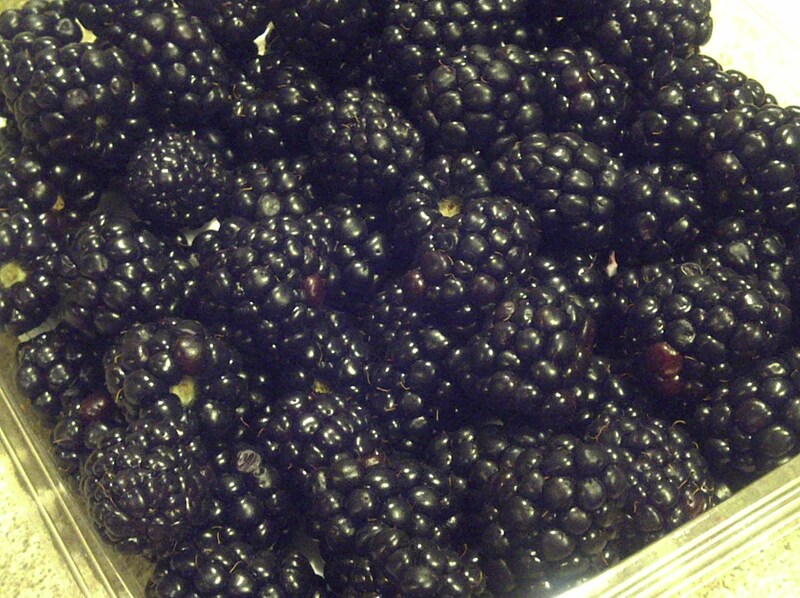 I got some pretty blackberries at Sam’s on Friday. 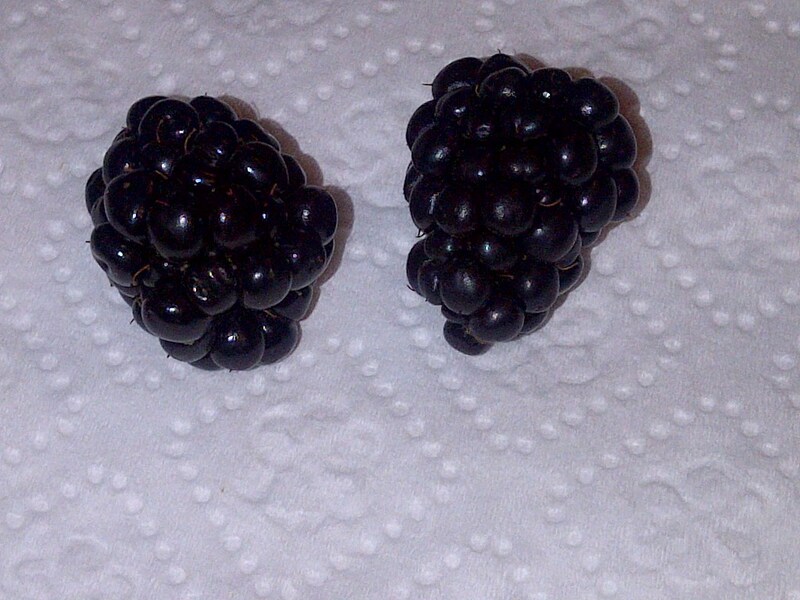 I don’t remember the last time I bought blackberries. Neither does Aaron. I told him that they are blackberries. He was very intrigued by their color and their shape, but his conclusion was that they definitely have the wrong name. And you know, they do have many little circles that are all put together to make: Circle Berries!! The other item I bought was a bottle of Sweet Banana Wax Peppers. He saw them in their jar and was puzzled. “Mom, why are they called wax peppers?” I wasn’t sure, really, so told him I didn’t know. But I assured him that they are not wax, even pulling one out for him to reluctantly smell. Once you decipher that sentence, it really makes perfect sense. Nope, Aaron………..that stork legend is just that…………a legend (since that’s what he likes to call it). Right………….storks are not baby bringers…………not at all. And I’m glad he left the kitchen on that note, before he wanted to talk any further about baby bringers! I remained calm and unaffected……….outwardly………..even as I felt the blood draining from my face. But I reminded myself that I had not received a call from mall security, Wichita police, Aaron’s day group, irate parents………….time for a deep breath. I didn’t wait long for the rest of the story. Well, well, well. Tiffany is another client and a friend of Aaron’s. I’m sure that Tiffany got a good laugh out of this because she and Aaron apparently laugh a lot about lots of things. I don’t really want to know, honestly. Aaron thought that all of this was “quite funny.” I’m sure all of this was “quite loud.” I can just hear Aaron’s and Tiffany’s unfiltered, boisterous exchange in the middle of the crowded mall. Again, some things are best to be left unknown. I wanted to ask if the “statue’s” name was Victoria and did she have a secret…………but thought I should just move on to Aaron’s next topic and leave well enough alone. Author hesaidwhatksPosted on March 24, 2012 Categories UncategorizedLeave a comment on A Statue Wearing WHAT? !